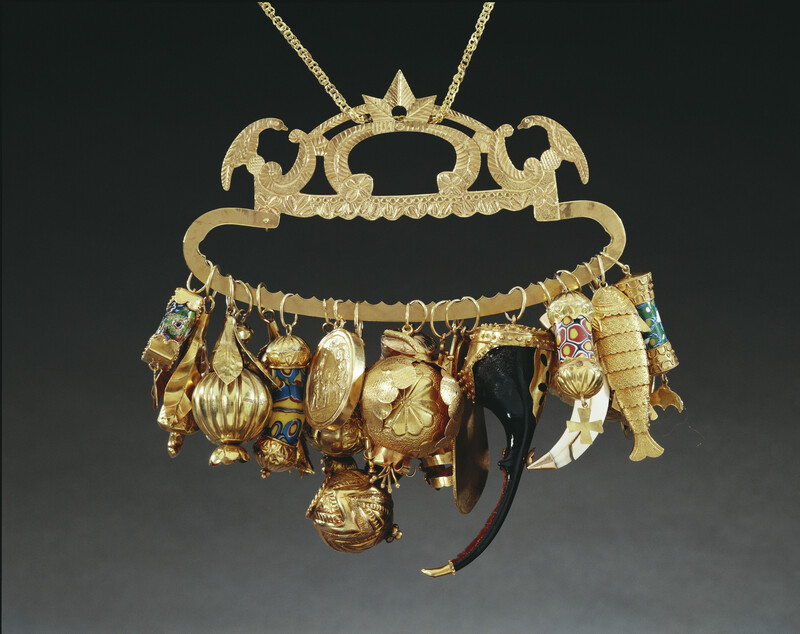 A balaganda: a collection of Brazilian gold and enamelled trinkets or 'charm' ornaments held together by a gold ring (pente) with a crown on the loop and a chain for attaching to a belt. In a square box with a hinged lid covered in red suede and lined in red silk. Stamped with the Brazilian crest. With an accompanying letter. The pieces include an articulating fish, tambourine, sandal, a scarab tooth (a symbol of love, since when ground to powder scarab tooth acts as an aphrodisiac), an ivory horn (a charm for good luck), a pomegranate and other fruits (indicating a desire for abundant food) and a half coconut shell of the kind used as a dipper to take water from wells. The pente is crowned by a starfish, one of the attributes of the Inca Water Goddess, and flanked by doves which represent the Holy Ghost. Balaganda were traditionally worn by Brazilian women on feast days and holy days. They incorporated trinkets from a variety of materials, such as gold, silver, coral, wood, iron and bone. Many of the forms represented had symbolic significance, and the balaganda as a whole might be worn as an amulet or spiritual defence, or as a love token.